Television/radio personality and actor Terry David Mulligan has been entertaining and informing the masses on music and pop culture for over forty years. He has had a varied career starting out as a Mountie in Alberta, including a stint as a Gap spokesperson throughout the USA and the MC of the first Greenpeace concert. Appropriately, his Hall of Fame Star is laid in front of the iconic Vancouver music venue, The Commodore Ballroom. Terry was born in New Westminster, BC and grew up in North Vancouver. He spent four years as a Mountie before Red Robinson hired him to host a radio program about pop music at CFOX in Vancouver in 1967. Although he was an extremely dedicated servant to Queen and country, in 1964, he gave up his horse to ride the airwaves. TDM spent the next two decades as a DJ at such stations as CKRD, CKLG, CFUN and CHUM. He also programmed Canada’s first underground FM station CKLG/FM, now CFOX, hosted CBC’s Great Canadian Goldrush and the nationally syndicated show, Discumentary. For his work, Terry received Canadian Announcer of the Year and VJ of the Year awards as he branched out from radio in the 1980s to share his musical expertise on CBC's first network video show, Good Rockin' Tonight. This led naturally to his post at MuchMusic, where he created, produced and hosted MuchWest for 14 years. More recently, Terry David was a host and segment producer of MT-Movie Television (120 countries), and a Senior Segment Producer and interviewer for the Star! Canada’s Entertainment Network and StarDaily! 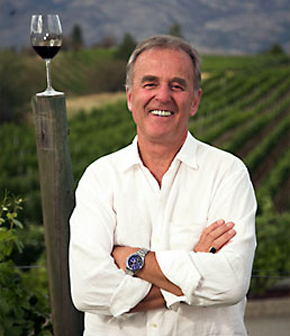 Currently, Terry is back on the radio, as host of “Tasting Room Radio”, for foodies and wine-lovers alike, and “Mulligan Stew” a multi-genre music program he records out of his Okanagan home. Tasting Room Radio is in it’s fourth year. Based on the Naramata Bench above Penticton, it’s a weekly two hour food, wine and entertainment radio show which Terry hosts and produces. The show is heard throughout the Okanagan and Vancouver Island and province wide in Alberta on the CKUA Radio Network (CKUA also broadcasts Mulligan Stew). Terry and Jason Priestley are co-creators and co-host “HollywoodandVinesTV”, a nationally syndicated food and wine TV series shown in 70 countries. The show takes them to wineries and vineyards around the globe and is entering its third year of production in 2011. H&V is seen nationally in Canada on Super Channel and around the world internationally on Travel Channel UK. In between hosting and making tasty wine, Terry’s new book; “Mulligan's Stew: My Life... So Far", shares stories of his life in, around and behind the media spotlight. It was released in October 2011. As a media and arts insider Terry can speak on staying relevant in the media, the importance of the arts, creative thinking in the workplace and career transition and longevity. Terry is available for speaking engagements, or as host of corporate events. As well, he can be booked for wine and culinary festivals.